David Storey is often perceived as a hero among playwrights, and even among those writers who are in ignorance of, or out of sympathy with, his work. And it’s for one simple reason. He cuffed The Guardian’s long-serving theatre critic Michael Billington around the head and shouted “id-i-ot” at him for the labelling his 1976 play Mother’s Day “a stinker”. Storey, who died earlier this year aged 83, as well known for his novels as his plays, Wakefield born, former rugby-league player, and Slade School-trained fine-artist, had done the thing we’ve all fantasised about on occasion and thumped the author of a bad review. Dominic Dromgoole dubbed me “the writer as bloke” in his 2000 compendium of contemporary playwrights The Full Room, but really there was only ever one David deserving of that soubriquet both then and for eternity. I’m familiar with all the major Storey plays (such as Home, The Changing Room, The Contractor and In Celebration) but I was curious about a rarely performed late play, The March on Russia (originally produced at the National Theatre in 1989). I have the play in an anthology but I’d neither read nor seen it. I noticed the play had been revived by Up in Arms Theatre Company with the Orange Tree Theatre in Richmond in a production celebrated by the critics. 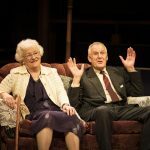 Up in Arms “make plays about people and the places they are from”, so the prospect of a deeply affecting and, perhaps, deeply autobiographical play rooted in a retirement bungalow somewhere near the Yorkshire coast appeared a perfect fit. But as I peered down on the modest sitting room resplendent with discreet and well-turned late-eighties detailing down to the radio and teapot, I was unprepared for the following two and a half hours. The story of Storey’s play concerns the return of the Pasmores’ three adult children as they celebrate their diamond wedding anniversary. The elderly former collier, his wife, and the now middle-aged kids (one some kind of academic or writer up from London; another a local politician; the other a housewife) drink endless tea, laugh, fall out, dress up and go for a drive and for lunch, share secrets and keep secrets, hurt each other and then mostly forget all about it because they love each other deeply. The play is made in a beautifully elegant symmetrical form beginning at three in the morning of the anniversary, and ending as day breaks the following morning. As Michael Coveney writes of Storey “the conflict between his roots in the north and a sense of powerful dislocation in the south, as well as feelings of guilt and atonement in family life” are all powerfully rendered. The writing is diamond hard and one exchange between Mrs Pasmore and her daughter Wendy elicited a gasp. “If you’d had a child you’d understand” says the elderly lady brooking no quarter in the face of her daughter’s attempts to sort out a problem with a local shopkeeper. perhaps one of the finest comic husband and wife sparring matches you’ll ever see…parents who seem to have learned a music hall double act entirely made up of bickering, recriminations and mutual disingenuous incomprehension, but which I mean that they both play the game of making out that they don’t understand each other. All in all a rich meal, but I suppose what really bowled me over was how deeply effective the detailed naturalistic gesture of the play in a splendidly acted and restrained production was. In our current theatre culture detailed realism or naturalism is often viewed as a conservative form, by its detractors for showing the world as it is (rather than imagining a new world). But after a decade of a kind of directors’ theatre inhabiting many of London’s stages; a theatre full of bells whistles and abstracted stage worlds; “The March on Russia” felt like something radical. In Alice Hamilton’s production I felt as if I was watching primary experience rather than retold lived experience. At its simplest theatre is just a group of people sharing a story with another group of people in the same room. Sharing a present tense with such a beautifully realised and truthful human experience seemed to elevate the production beyond merely seeing an ace play. We really were in the room with the Pasmores and their hopes and tragedies really did become ours for that two and a half hours traffic on the stage. The Pasmores became the Eldridges – and the Eldridges, the Pasmores. The March on Russia plays at the Orange Tree theatre until 7 October 2017. David Eldridge’s new play Beginning plays at the National Theatre from 5 October 2017.